Urban Meyer looks to the recruiting classes of 1992-93 as the best in UF history. 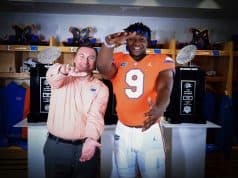 They have been called the best recruiting class in University of Florida history and by some scouting services, they were the best recruiting class in the country back in February on national signing day. Without a doubt this recruiting class of 2006 is plenty talented but until they prove it on the field Coach Urban Meyer isn’t ready to declare them the best. 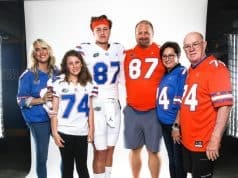 By Meyer’s standards, the best recruiting classes in Florida history were those put together for 1992 and 1993. When the players in those classes finished their playing careers, they had multiple championship rings and the way Meyer looks at it championship rings are the true measure of greatness. With headliners like U.S. Army All-Americans Tim Tebow, Percy Harvin, Carl Johnson, Brandon Spikes and Jamar Hornsby in the 2006 class, there is plenty of hype to go around but Meyer has made it a point to use the 1992-93 classes as the standard he wants his talented newcomers to emulate. He’s already had a couple of players from the 1996 national championship team in to speak to the freshmen and he’s been showing them game film from the championship seasons (Florida won the 1993-96 SEC championships along with the 1996 national title). There are even plans for a night of game films from the championship years this week to get the entire team in the right frame of mind. Additionally, each player has been given a card. Some of what’s on the card Meyer won’t say but he admitted there are pictures of the five championship rings. Two of the freshmen didn’t participate in Sunday’s first practice and there was a scary moment that involved safety Bryan Thomas. Early in the practice, Thomas went down with a twisted knee. He’ll be given a precautionary MRI but Meyer said early indications are that it’s nothing serious. Defensive tackles Terron Sanders and Corey Hobbs were in The Pit Sunday afternoon. Sanders had his knee scoped about four weeks ago but it’s not considered serious. Hobbs has a foot ailment that is keeping him sidelined temporarily. 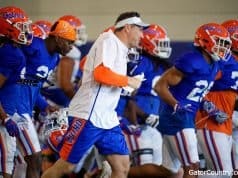 Although most of the practice was one in which coaches are constantly telling the young guys what to do and how to do it, it was obvious in passing drills that there is an abundance of speed. Wide receivers Percy Harvin and Jarred Fayson have an extra gear that you don’t normally see. Running backs Mon Williams and Chevon Walker showed a nice burst of speed while running pass catching drills. Wondy Pierre-Louis has plenty of speed and he has that look of truly natural athlete. Among the linebackers, Brandon Spikes looks big and strong enough to play right now and Dustin Doe is a good 15 pounds or so heavier than he was during his high school season. Tight end Trent Pupello looks big and strong but he looked small standing next to defensive end Lawrence Marsh. Pupello is every bit the 6-4 and 256 he’s listed at but Marsh looked huge when the two were side by side. A welcome sight was the missing baby fat around the waist lines of offensive linemen Maurice Hurt and Carl Johnson. Johnson, who reported back in January at 365 pounds, is now 322 and his goal is to get down to 317. Overall, Meyer said that most of the freshmen have a long way to go to get where he wants them in terms of strength and conditioning. Meyer said the Gators would be working on their two-minute drills in the opening practice Sunday night, a clear indication of how far the team has come in one year. “It took us a week and a half to get to that last year because we were putting in our base plays,” he said. Meyer is also ready to see quarterback Chris Leak in action. He is expecting Leak to be vastly improved over a solid but unspectacular 2005. Meyer expected all his veteran players to be ready to go Sunday night with one exception. It might be another day or so before defensive tackle Steven Harris knows his fate. Harris was suspended from the team during the spring because of some personal issues. He’s been working hard to get back in the good graces of Meyer and the coaching staff in the summer. “We still have to make a decision on that one,” Meyer said.